It’s a zoo at Children’s Theatre of Charlotte! Alex the Lion, Marty the Zebra, Melman the Giraffe, Gloria the Hippo and, of course, those hilarious, plotting penguins have all escaped from the Central Park Zoo and now find themselves on a journey to King Julien’s Madagascar. Based on the smash-hit DreamWorks movie, this musical adventure is filled with outlandish characters, an upbeat score and songs audiences know and love. “Both grown-ups and kids won’t be able to help getting out of their seats to ‘Move it, move it!’ along with us,” Michelle Long, director, said. 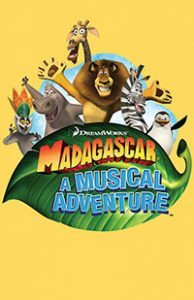 Madagascar – A Musical Adventure debuts at Children’s Theatre of Charlotte April 13 and runs through May 6, including a sensory-friendly performance at 11 a.m. on April 21 and a signed performance at 3 p.m. on May 15. Audiences can purchase tickets online at ctcharlotte.org or by calling the Box Office from noon until 5 p.m., Monday through Friday, at 704-973-2828. We recommend this show for children ages 4 and older.